Initially the idea of running a Kill Teams event was proposed for 2010, but the ruleset was in dire need of an update. With no one to champion the cause, the proposal quickly faded into obscurity. With the release of the Battle Missions book just prior to AdeptiCon 2010, the idea was quickly brought back to the forefront and we immediately penciled it into the schedule for the following year. The trick to adding a new event to any convention is finding someone with the passion to see it made flesh. We did a bit of digging on the internet and not only discovered some fantastic work being done with the Kill Teams idea, but it looked as if we had a local champion of the format right here in Chicago! We contacted Brian (aka b.smoove) over at A Gentleman’s Ones to inquire if he might be interested in leading the charge. Brian was currently in the middle of his Sin of Alacrity mini-campaign, had recently joined the Killzone Rules Committee over at Galaxy in Flames and seemed like the right person to approach about running such an event. After a bit of discussion regarding the direction and nature of the format, Brian was fully committed to the cause and the event became official. The general concept of Kill Teams as presented in the Battle Missions book left a bit to be desired. Compared to earlier versions of Kill Teams, it was a very loose concept without much structure towards a narrative event. 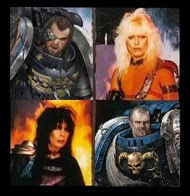 The idea of utilizing the work done by Big Jim and the Killzone Rules Committee over at Galaxy in Flames was broached, and soon proved to be a perfect fit both in terms of logistics and direction. “In the grim darkness of the far future there is only war; but war has many faces. Epic battalions wage endless conflict throughout star systems, grand heroes set themselves on the stage of the universe; mighty titans stride across virus ravaged worlds. But sometimes, the universe turns on a smaller stage. The blade in the dark, the brave last stand of the chosen few, the quiet work of closed doors and darkened strategiums. Special Operations Killzone is a set of fan created rules for creating and playing skirmish games within the Warhammer 40,000 universe. It is intended as a supplemental way to play the game, and as such a set of Games Workshop’s core rules and Codices for any armies used is essential to understand and play this ruleset. Players will choose an elite team and undertake vital actions set against the stage of wider conflict. This ruleset aims to enable cinematic play in the style of tier one assets of a universe at war. So just what will this Kill Teams/Killzone event look like at AdeptiCon 2011? Much of that is still to be seen, but we anticipate a series of one on one narrative missions played in 1-hour increments that will guide your team to glory or death! The event will accommodate 24 players and most likely run 4-6 hours. Special Operations Killzone will be featured at AdeptiCon on Sunday April 3rd, 2011. The Killzone rules are currently in the playtesting and development phase over at Galaxy in Flames (current playtest rules are available for download). The final ruleset is schedule to be released in January of 2011. Some of Brian's fantastic terrain. See more over at A Gentleman's Ones. Thank you for giving Killzone the opportunity to have an event at Adepticon. I will be happy to support this event in any way I can. Our pleasure. Really looking forward to playing some games and seeing this event in action. I hope to lend a hand this winter with terrain and playtesting. I'm thrilled to see this have the opportunity for the kind of event I love and would love to participate in, be a part of, or even spectate! Especially at an event like Adepticon. More and more reasons to save the dates and make sure I get up there early. Spot on, folks. I'm happy to support and drum up as much St. Louis support as I can! We are looking at possibly running this twice over the weekend. Sunday for sure, but we might be able to sneak in a Friday night event also. We are well on our way to releasing the the Killzone Beta test rules with Errata within next two weeks. I imagine that things should pick up pace shortly after! We will also open up our playtest forums to the public for direct interaction and feedback with the community. This will also coincide with expanded blog coverage too. We want to give you a quality game to have fun with! I was always a fan of Kill Team in 4th edition, and was quite upset to see the boring, dumb-downed version in the Battle Mission's book. The playtest rules that I saw look really interesting, and I'm going to try and get a small league going in my gaming group for it. The new improved Killzone Beta test rules are up on Galaxy in Flames. Including all 16 codex errata and the first 12 missions. Plus there is a link t the Killzone forum for direct feedback. Looks fantastic Jim. Really looking forward to getting some games in with b.smoove this Winter!